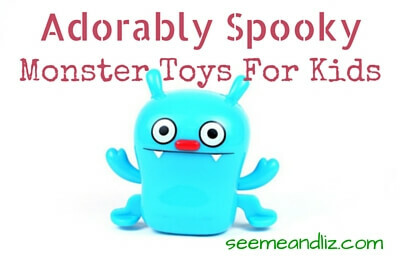 Seeme & Liz > Learning Toys (0-2 year olds) > Adorably Spooky Monster Toys For Kids That Promote Learning! Monsters don’t have to be scary! I make it a point of telling my children that monsters aren’t real, they are just toys and characters in movies. This is why you won’t find any Monster Spray in our house! Why would we need to spray something that doesn’t exist? If your little one is fascinated by monsters these monster toys for kids will be a great addition to your child’s toy box! Remember, children learn best when you follow their lead so it helps having toys and activities that they are really interested in. Along with each toy recommendation I will also provide language and learning tips that will help you play with your child! Be sure to scroll to the bottom for some monster craft ideas you can do with the kids! 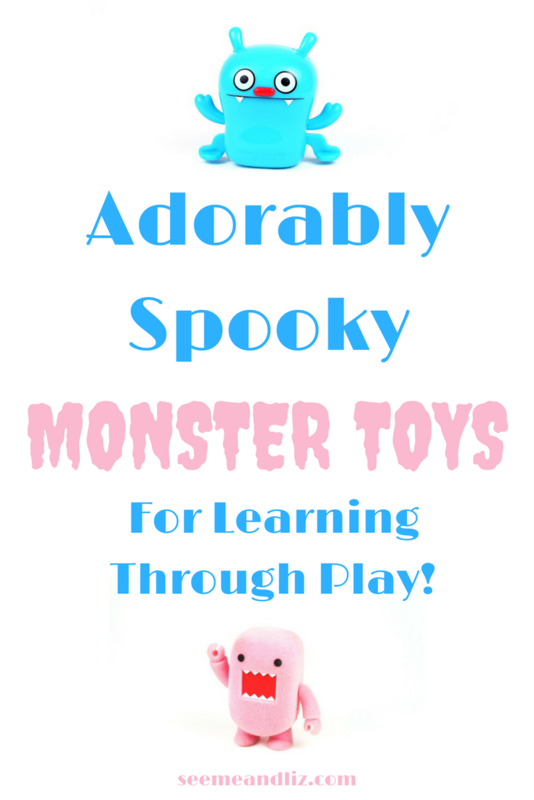 These Monster Toys For Kids Are Fun & Packed With Learning Opportunities! This adorable Melissa & Doug Monster Bowling set is great for young children! The pins and ball are soft and brightly colored. Once bowling is no longer fun, the monster pins can be used in many other ways, such as storytelling. Hand Eye Coordination – roll the ball and try to hit as many pins as you can! Having a bath is a great time for children to learn language as well as other skills. Bath toys can make bath time a much better experience for children who are not fans of the water. These monster bath toys are also squirters! Keep in mind that bath toys that have holes in them are prone to mold/mildew so make sure to squeeze out all of the water and hold them up to a light periodically to check for mold. We replace ours about once a year. Body Parts – bath time is a great time to work on body parts. Your child can point to his own and that of the monster! Talk about what the monsters are doing – for example, the green monster is swimming, the purple monster is floating, etc. Gund makes some great, high quality stuffed animals. Beeper is just one of the monsters in the Monsteroo series, so if you are looking for a different style and color they will probably have it! I am not going to go in to all of the language and learning tips as I have an entire article dedicated to the learning benefits of stuffed animals! If you have not read it, here it is: Stuffed Animals For Toddlers: Meet Liz, My Daughters Puppy! If you are purchasing a Gund Monsteroo for an older child have him/her document the adventures the monster is going on. Come up with some creative stories and write them down. You can even take pictures and make a monster scrapbook! Or have a monster tea party. But instead of tea, serve monster sludge. Puppets are great for creative open ended play. But now you can add to the learning experience by making your own puppet! If you have more than one child you may want to get more than one of these packs as there is only one puppet in each. However, it comes with 30 different pieces including eyes, noses, mouths, ears, horns, etc. Vocabulary – you can target body parts with younger children as well as some descriptive words such as: soft, bumpy, pointy, sharp, etc. If the child is young work on some basic words and actions to encourage pretend play. Give the puppet something to eat or drink, give the puppet a “bath”, let the puppet go to sleep, etc. Verbs – the puppet can have fun doing a variety of different actions, for example: jump, run, sleep, eat, dance, throw, etc. I am a big fan of playdoh! There is so much learning that happens when a child plays with playdoh! From a sensory experience to strengthening fine motor skills and language development, playdoh is a must have for all children. It inspires so much creativity and learning in a very fun way. Playdoh is very inexpensive to buy, but you can also make your own with a simple playdoh recipe and the kids can get involved and help! My kids have several playdoh games. They are all simple and easy to use. Great for kids ages 3 and up! The Playdoh Monster Smash Board Game will be loved by kids who are fascinated by monsters! Social Skills – you and your child can play this game together as a family or with friends. Children will learn to take turns. This is a cooperative games so it’s everyone against the monsters! Vocabulary – boot, shoe, monster, spaceship, stomp, my turn, your turn, etc. This game is better suited for older children (5+), but it is a lot of fun. We play it regularly in my house. Games such as this one teach children about winning and losing and that not everyone gets to be the winner. When we first started playing this game there were a lot of tears because both kids wanted to win every time. Now that we have played it many times, there is more laughter than tears! The premise of the game is similar to monopoly, get the most money (in this case “goosebumps”). But instead of buying and selling real estate you are collecting monsters such as the “bathtub monster” or the “broccoli monster”. Each monster comes with a certain number of “screams”. Whenever a player lands on one for your monsters you are to “burp” the number of screams that are owed and then get payed in goosebumps. Following Directions – examples in this game include “growl like a monster”, “pretend to be a 2 headed monster”, etc. This kit is for children over the age of 7, however, younger children could use it with supervision (use of the oven is involved). My kids have been using shrinky dinks and sets like this from about the age of 4. But they do get more out of it once they are a bit older. The Shrink Fun Monster Lab comes with everything that you need to create your very own monster lab (in 3D)! Children can get quite creative with this set. As this set is meant for older children I won’t go into every little detail. New vocabulary can always be introduced and this kit is no exception. Since you will be assembling it in the kitchen you can also include kitchen words that your child might not be familiar with. Make predictions – what do you think will happen when the pieces of plastic go into the oven and why? Take a look at some of these cute monsters you can make yourself or with your kids (depending on their age). 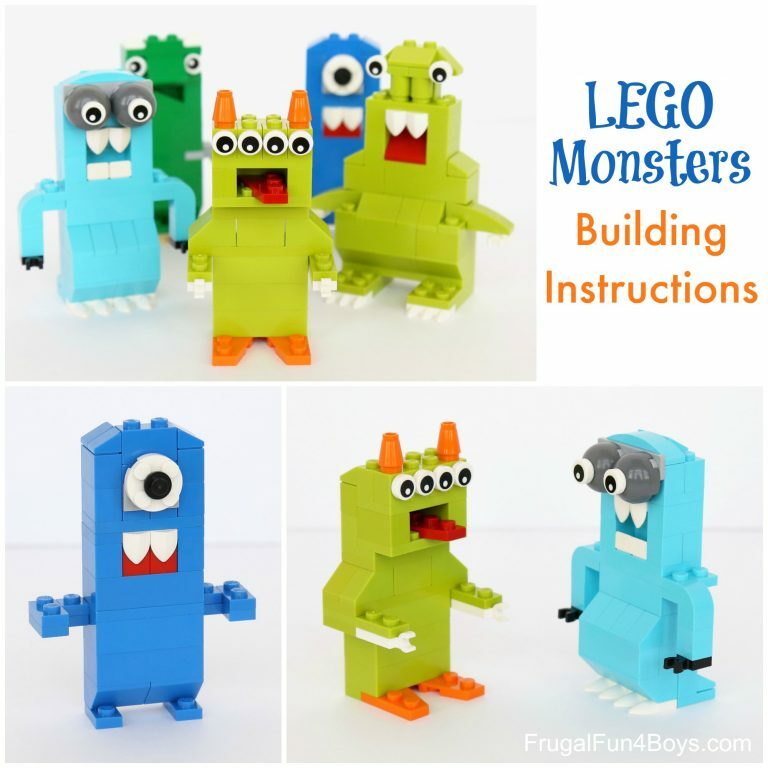 Head over to Frugal Fun 4 Boys for all of the instructions! Lego is a great way for children to build and strengthen fine motor skills, problem solving, collaboration and teamwork, vocabulary and so much more! My daughter is 10 and has recently gotten into making pom poms with yarn. 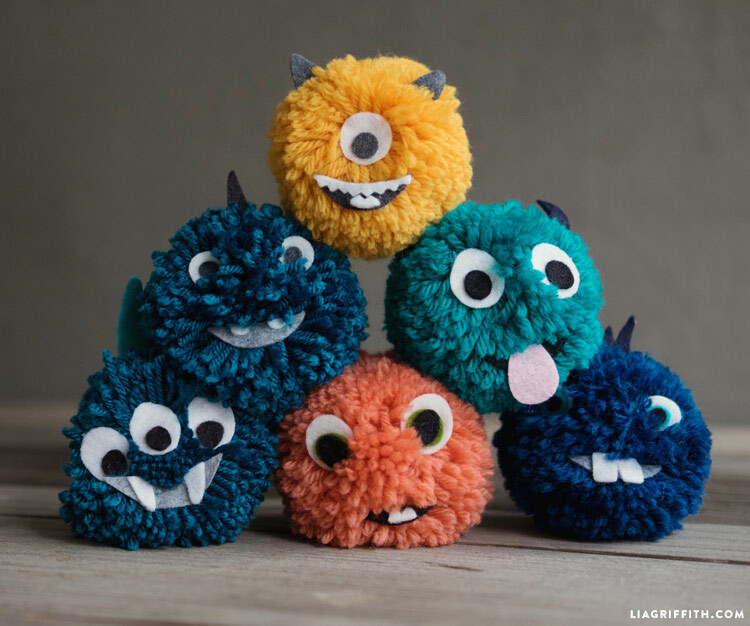 These pom pom monsters are simple enough for kids to make! And once they are done they can play with them too! Head over to Lia Griffith for video instructions! Do your kids love monsters? What are their favorite monster toys? Please share your thoughts in the comments below. Thanks for your comment. I think you may have left it under the wrong article though as I didn’t mention any books in the Monster Toys for Kids article. I really appreciate you taking the time to look around the site though. I assume your comment was meant for the Best Books To Read To A Baby article. These are no ordinary toys, but yet they look cute and fun to play. I wish I had some of these “creepy” toys when I was a child growing up. If I have my pick, I want the Monster Lab. As an adult, (believe it or not) I have different teddy bears, stuffed fish, plush crab, a dog, and Pink Panther. I also have a tiny stuffed bear that sits by my computer. Really nice review on all these toys and how they can help children with language and learning. Thanks so much for your comment. So many kids are fascinated by monsters. They don’t have to be scary. If your child loves monsters, there are so many great learning opportunities that can be explored with these toys. Who knew that monster toys for kids can promote language development and learning! Unless the monster has a different meaning, then the answer to that question of monster exist or not is not necessarily the same. The bowling set can be a way to make kids interesting in bowling, as opposed to bowling being no longer fun. Honestly, I fund Gund quite creepy. The horns and the two teeth sticking out scares me truthfully. Thanks for your comment. I am not sure what you mean by your first statement. But in our home we know that monsters are made up characters in movies and books. 3 eyed multi-colored creatures don’t actually exist. My kids love the Gund monsters. They are so soft and cuddly. But to each their own I guess!